Save money with used products! Individual, yet suitable for everyone. Minimalistic, yet full of elegance. High Performance and made for your next project: The Alphacool Eisblock GPX! Alphacool has already created a name for itself with its Eisblock GPX series among modders, gamers and performance enthusiasts. Alphacool offers several models to fit many NVIDIA® graphics card layouts, so there's something for everyone. For the first time the Eisblock GPX Plexi Light and Plexi is equipped with ARGB (Addressable RGB) lighting. Also, for all fans of simplicity Alphacool also offers the classic acetal version, which lets your GPU stay sleek and beautiful with a minimalistic noble design. 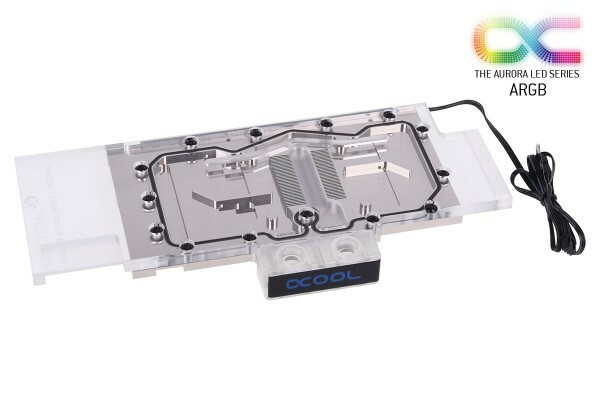 The Alphacool Eisblock series is based on completely nickel-plated copper bottoms, which are made from a single block of copper. The flow is optimised by the generous water channels in the best possible way so that they have been finely tuned to dissipate the heat. Thanks to the full cover design, all coolers have the performance to cool your GPU during all gaming and heavy-duty activities in the best possible way. This gives your hardware a longer life and protects it optimally. The included backplates puts the finishing touches to the Eisblock and perfectly crowns it. Thanks to new ARGB technology, you can customise the Eisblock Plexi and Plexi Light more than ever before. These 5V addressable RGB LED´s can be connected to the Alphacool EIscontrol Controller (1015857, sold separately). Whether you like it colourful like a mystical unicorn or if you just want a single colour. The Eisblock with ARGB lighting makes it possible. With the Eisblock Plexi variant you can see the fluid running through your water block and with the Alphacool Eiswater your gaming system is the eyecatcher at every LAN party. In addition to the increased performance, you have another advantage of water cooling in all situations: no annoying fans on your GPU and no excessive temperatures that make your graphics card howl. The Alphacool Eisblock Series completely replaces your GPU air cooler and helps you towards that silent system you've longed for. 1 Kysymys on muilla kielillä. Napsauta tätä, jos haluat näyttää tämän kysymyksen. Bonjour, j'ai une Aorus 2080 rtx , voyant qu'il y'a des gigabyte 2080 gaming oc, est il possible que ça soit compatible ?